Please note that orders due for delivery to WA are not expected to arrive until March 2019 due to Vuly's stock levels. Vuly takes another leap into the future with Thunder Pro which boasts refined Leaf Spring technology to deliver more power to your bounces. Next generation mat and net designs push safety and modularity to the next level. Soft and safe Terylene enclosure. Better bouncing on pre-curved Leaf Springs. 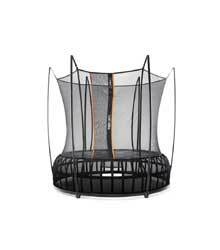 Bounce without twist and strain. Exclusive, matte black frame treatment.